I spotted this great story over on Revolution Magazine. The virtual world Habbo Hotel has teamed up with the MTV Europe Music Awards to create an online MTV-branded space for users of the site to hang out back stage and become pop stars, and they even have the chance to win a virtual award. The virtual awards allow Habbo members to visit the main stage, walk on the red carpet and access several back stage areas. 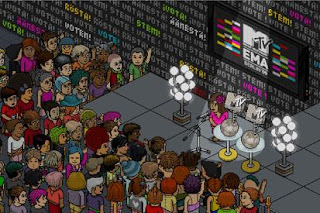 Habbo members also have the option to vote for their favourite artists, and participate in a number of competitions and activities in the build up to the actual MTV Europe Music Awards. Christian Batist, senior vice-president of marketing at Sulake Corporation, the creator of Habbo, said, "Music is the sole biggest asset that our teen users value in their lives, and thus we are extremely happy to partner with MTV Europe Music Awards. The highly involving activities in Habbo will allow us to activate a massive music-loving user base to take part in the awards. We aim to generate massive amounts of votes for the MTV Europe Music Awards from our Habbo audiences around the world." Habbo Hotel, which is a virtual world geared towards teens, attracts over 14 million monthly unique visitors.